Along with a dozen or so winemakers, merchants and journalists I recently spent a weekend in Porto with Dirk Niepoort where we celebrated his 40th birthday. 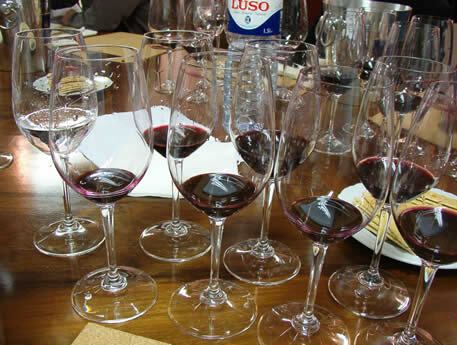 Among other events, we had a tasting of Port samples. This was a fascinating opportunity to take a look at some of the Niepoort Port components from the 2003 vintage. We weren’t told anything about the seven glasses in front of us, which all contained a dark, impenetrable sample of port. Our job? Simply to comment on the different components. It was quite a challenge to try these concentrated, tannic concoctions, especially in the morning: I tried them all through and then started trying them again, but before long my mouth began to feel like leather. As with any cask samples, I was trying to look beyond the nose: at this early stage you don’t necessarily want wines that are already open or showing too much. My own feeling (which could be wrong) is that what matters at this stage is the balance and structure on the palate. Here are my notes as written blind, followed by a summary of Dirk’s comments on each. This was the really interesting part of the exercise: hearing what he (as one of the Douro’s most respected Port blenders) has to say about the potential for each as components in a final blend. Blending is an art form that requires quite different skills on the part of the taster than those used typically by critics. I gave each a score (take this with a pinch of salt) merely to give you some idea of how I ranked the merits of each. However, it became clear by chatting to Dirk that some of the wines that are the most balanced and complete now might not be the most useful to him as a blender. I should add that all of these wines apart from 4 were of course made in lagares with the stems. This is from the Pisca vineyard, which has recently been purchased by Niepoort. It’s very powerful and not overextracted. This vineyard gives tannins and has the most intense and amazing fruit, but it’s not a perfect wine on its own. From a young-ish vineyard in Tua (25 years old), the same as sample 3. During the harvest we were not sure of this. It has the most amazing colour and is the most fruity, and there was some volatility at harvest. I’m overwhelmed when I taste it, but it is not a wine that I like. It is showy, huge and overripe and it will probably go into Secundum. This is the best wine from the Tua vineyard. It has good balance, although it is not the most complex of all. It is the most perfect on its own. This is a cocktail we made that broke all the rules. It is overextracted and we did everything wrong, but it doesn’t show it and it is getting better all the time. It doesn’t taste as sweet as it is. It has fruit that I like more and more. This is a blend from different growers in Vale de Mendiz, from very old vines. It’s a wine I like a lot, with acidity, personality and elegance. I may use it for the Niepoort vintage, because it might contribute elegance and personality. This started off lighter in colour than the others but I think by the time of blending it will have the same colour. I think this is one of the best. It is very sweet but it is one of the most complex wines. This turns out to be a blend of more-or-less equal parts of 1–6. 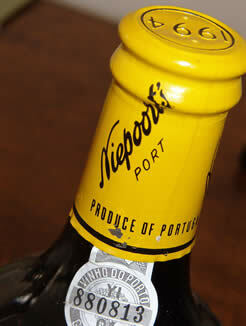 Overall, it looks like the 2003 Vintage Niepoort will be a very fine wine.